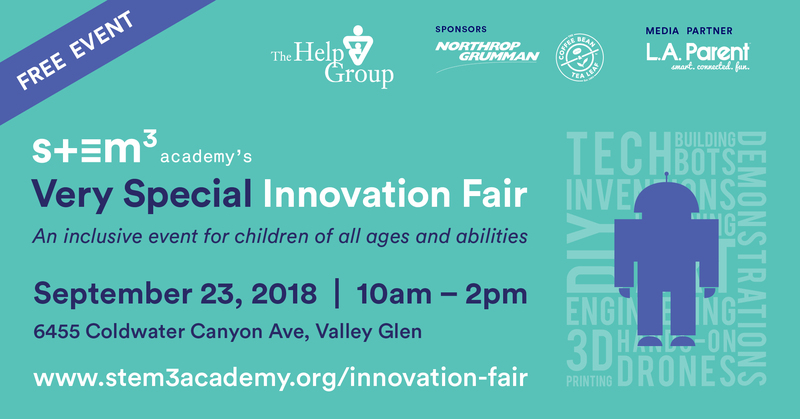 STEM³ Academy's Very Special Innovation Fair, under the umbrella of The Help Group, is a FREE, family-friendly showcase of discovery and imagination that is equal parts science fair, high-tech exhibition, art show, and community carnival. Inspired by the maker movement, hundreds of young STEM enthusiasts will have the chance to build things, get involved in experiments and demonstrations, and take various gadgets for a test drive. Attendees will have a first-person experience in a range of STEM-related fields, including rocketry, robotics, 3D printing and production, virtual reality, and others. There will also be food and giveaways. This is an inclusive event for children of all ages and abilities. Some of the region’s most innovative companies will be on site to help facilitate activities. To participate as a STEM partner, email Neil Schwartz at nschwartz@thehelpgroup.org. Event will take place rain or shine. If necessary, exhibitions will be covered or moved indoors. Check out last year’s Innovation Fair here. (on the corner of Coldwater and Victory). The structure is behind the theater. Carpooling and ridesharing is encouraged!